Retail price: $895.00, 1,175.00 USD with Magnequest Option, Shipping is $25.00. 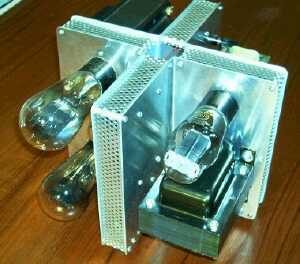 To afficionados of single-ended triode (SET) power amplifiers, the 2A3, directly-heated triode is the stuff of legends. Many believe it has the best balance: a superior melding of audio charm and power compared to other power triodes. While power amps that use the 2A3 were rare just a few years ago, they are now plentiful - builders of such amps may be found in several countries, and good quality, new manufacture, 2A3 tubes are available at reasonable prices. For example, while the Holy Grail of 2A3s, the RCA Single-plate, can command prices near a thousand dollars for single, pristine examples, the Sovtek single-plate 2A3 can be purchased for less than $60 per matched pair. 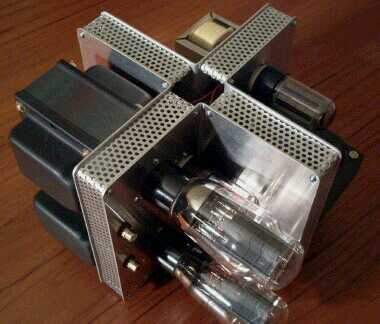 If 2A3 tubes have seemed expensive in the past decade, amplifiers that use these tubes have been much worse. However, several manufacturers, including Fi Audio of New York, now make affordable versions of their 2A3 equipment. The founder of Fi Audio, Don Garber, is well-known and respected as a prescient and uncompromising designer and engineer who was building and selling SET amplifiers long before it was fashionable. His current top-of-the-line model, the 2A3 Monobloc, has a reputation as one of the finest-sounding amplifiers available in the world today. At $2,975 USD per pair plus shipping, the price has to be considered a bargain compared to the rarefied company with which the 2A3 Monoblocs share the spotlight of "best in the world." Still, the price of the 2A3 Monoblocs is too high for many. 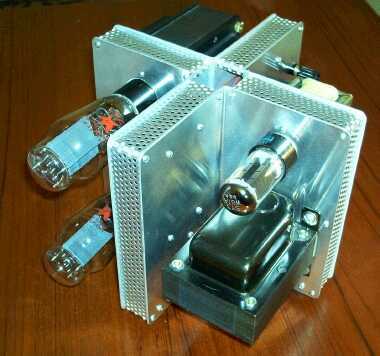 Don decided to produce a low-cost amplifier that would still have excellent sound quality. He went back to the drawing board and designed one of the most unique amplifiers in the world, the 'X' model. One look at the above photograph will confirm the unusual chassis design from which the 'X' derives its name. With a starting price of $895 USD, it is also among the cheapest 2A3 amps available. In addition to the X power amp, Fi also produces the 'X' Integrated amplifier, the 'Y' preamp, and the 'Yph' (pronounced "if") phono preamp. All are vacuum tube designs that use variations on the unique 'X' chassis design, and all rely on octal triodes for gain stages. What Is the Fi 'X'? The single, most obvious feature of the X is the chassis. Where most tube amplifier chassis are shallow, rectangular boxes with smaller parts inside and tubes and transformers on top, the X has an 'x'-shaped chassis made from aluminum sheet. The four exterior quadrants of the chassis contain the larger components, and the space on the interior of the X, between the quadrants, contains the smaller parts. The major components are somewhat shielded from each other by the chassis itself. This configuration also helps to keep signal wires short relative to many other designs. A vented aluminum grid covers the space between quadrants. When looking at the front of the amplifier, the right front quadrant contains the power transformer and the rectifier tube; the right rear quadrant contains the filament transformer, a pair of chokes, an IEC power connector, and speaker binding posts; the left front contains the signal tubes, power tubes, and input RCA jacks, and the left rear contains the two massive, Magnequest output transformers. The X is quite compact, at 19cm (7 1/2 in.) tall by 23cm (9 in.) across. The chassis is so small that many 2A3s, including the stock Sovteks, extend beyond the chassis. As unusual as the chassis is, the X has a very simple circuit design with only a couple of surprises. Power rectification is by a 5Y3WGTA, full-wave rectifier tube. Signal input duties are handled by a pair of 6SF5GT high-mu triodes. The standard power triodes supplied with the X are a matched pair of Sovtek, single-plate 2A3s. While staring at a copy of the Fi X schematic, I thought something was missing as there were no resistors or capacitors in the signal path. Don Garber confirmed that this is a directly-coupled design. While some manufacturers of high quality tube equipment tout the fact that their amplifiers only have two or three passive components in the signal path, the X has zero passive components in the signal path. The price of custom power transformers that supply 2.5 volts to the filaments can be quite high. In trying to keep the price substantially lower than the 2A3 Monoblocs, Don Garber's solution was to use a separate filament transformer to provide the required 2.5 volts. This voltage fix 'won't work' according to some designers. Don't tell that to owners of the Fi X - it might surprise them to know that their amplifiers don't work. The filament transformer supplies the required voltage in AC to the filaments. The X model comes in a few optional configurations. The basic model starts at $895 with standard output transformers. The sample Fi X has the Magnequest upgrade, which replaces the standard output trannies with a pair of very large, heavy Magnequest output transformers. One additional upgrade, the "Super X", is also available. The Super X has a slightly larger chassis, which allows larger, higher quality capacitors and other higher quality components compared to those in the standard X. Any other custom modifications must be discussed with Don. The Fi X, first and foremost, is an exceptionally musical amplifier. All discussions of its high-fidelity merits must begin and end with that observation. The rich, full sound is truly involving, whether the volume is set at very low, late-night listening levels, or turned up to the edge of clipping. The pacing and timbrel qualities always seem correct. The X is almost liquid-smooth in its delivery, always pleasant, never fatiguing. This amp delivers excellent musical detail, although sometimes it doesn't quite match the extremely fine detail provided by some power amplifiers. Much listening and comparison reveals that nearly all the fine details are present. However, with some amplifiers, it seems as though minor details are brought forward and highlighted. With poor recordings, this type of detail exaggeration can be detrimental to listening pleasure. While the X delivers great resolution, fine details are not elevated in apparent status above other aspects of the music. With the Fi X, even substandard recordings can be enjoyable, which cannot be said of some high end amplifiers. The standard Fi X, which sells for $895 USD, uses smaller output transformers than the sample version. Reviews of that model usually note that bass tends to be a little light and that it lacks expected low end extension. The Magnequest upgrade fixes that complaint by providing much larger, substantially higher quality transformers. Bass on the sample Fi X is deep and powerful, belying the feeble power rating. A pair of B&W DM602 speakers could be driven to surprisingly high volume levels with reasonably clean and well-controlled bass as deep as the speakers would allow, despite their efficiency rating of only 90dB. When comparing the bass performance of the X to the BV Audio PA300, a 110-watt per channel, solid state, stereo power amplifier, the BV Audio amp definitely had the advantage, allowing higher volume with better control of the drivers. SET amps have garnered a reputation for "soft", poorly-controlled bass performance, but the Fi X did a reasonably good job of driving the B&Ws, despite the poor match of efficiency and available power. When more suitable speakers were connected to the Fi, bass performance improved. With a pair of Omega TS2R loudspeakers (94dB, single-driver), the Fi produced deeper, cleaner bass than with the B&Ws. It was better able to control the drivers and provide quick, solid bass transients. The PA300 still had an advantage in woofer control, but the Fi was able to deliver bass that was deep, strong, and satisfying. Nights in the Gardens of Spain, from Benise's Mediterranea CD, contains deep bass and very powerful percussion. While the Fi X and Omegas could not match the impact of the live concert performance (neither could the PA300), they were able to reproduce the power and emotion of the performance. The Fi X Magnequest easily was able to deliver well-controlled bass to the lowest frequency that any available and suitable speaker could produce - in this case, into the low 40Hz range. There is no doubt the Fi X could produce deeper bass, if suitable main speakers were available. While bass performance of the Fi X was very good, no one buys SET amps for their bass performance - they are renowned for their mid-range sound. In this regard, the Fi X does not disappoint. It delivers mid-range performance that is stunning in its lifelike quality. Acoustical instruments, from guitars to violins, from pianos to cellos, have a presence that is sometimes surprising and always engaging. For example, the complex harmonics of a piano, an instrument notoriously difficult to properly reproduce, are rendered with wonderful accuracy, and stringed instruments resound with a realistic resemblance to a live performance. Notes that may sound flattened and two-dimensional with many other amps seem properly rounded, almost solid in presentation. The acoustic guitar work in the Pretenders Isle of View CD is delivered by the X in an amazingly clear and sharply defined manner. On a more intense recording, the Fi X was able to bring out the power of Yo Yo Ma's performance in Haydn's Cello Concerto in C Major. While acoustical instruments sound superb with the Fi X, vocals are even better. Patricia Barber's poignant So in Love With You comes across with subtle nuances intact, and Mary Black's Song for Ireland was truly inspirational. Combined with proper loudspeakers, well recorded vocals sound real, whether sitting in front of the speakers or hearing the recording from another room. Male vocals are equally well-delivered. The Fi X is capable of producing mid-frequency sound that is simply beautiful. The high frequency performance of the Fi X also is excellent. Transients are quick and clean, and high frequency notes are clearly rendered. There is no trace of grain in the high frequencies, and the Fi X is never harsh or fatiguing. The Fi produces a deep and wide soundstage that seems to expand beyond the limits of the listening room. Holographic imaging is not as convincing as some amps, but instrument locations are clearly defined and there is sufficient 'air' around them to keep them well-separated - with good recordings, anyway. The Fi X works best with high impedance loads. While it sounds excellent with 8 ohm speakers, bass control becomes somewhat tighter and cleaner at higher impedances. The Hornshoppe Horns, which use single, full-range, 4-inch, Fostex drivers, were designed and voiced using a Fi X. It is no surprise that they work exceptionally well with the X. However, there is a slight, but noticeable, improvement when a pair of Zero Autoformers were used as impedance-doublers to bring the Horns to 16 ohm impedance. There was no loss of bass depth, but bass control and mid-range clarity improved slightly. One common characteristic of SET amps is their superb low-volume performance. The Fi X is an excellent example of this, delivering full, rich-sounding music even with the volume at very low levels. Solid state amps tend to sound 'gray' and lose soundstage depth at similarly low volume conditions, requiring either a volume boost or some form of loudness correction. The X is rated at 3 watts per channel into 8 ohms. While this small power rating would seem inadequate for most speakers, the X does deliver sufficient power for many commercial speakers when playing the music for which it is best suited, provided the efficiency rating is 90dB/1 watt/1 meter or better. The Fi excels with acoustical instrumental, jazz, vocals, and chamber music. This does not mean it cannot play other types of music, such as heavy metal rock or powerful and dynamically orchestrated classical music, but there are other amps that are better suited for that purpose. The build quality of the Fi X is excellent, as each unit is point-to-point wired and hand assembled by Don Garber. The X has very impressive visual aesthetics, at least if one's taste runs to the extraordinary. Some people will look at the X and say, "That is weird." Others, will be delighted by the unique character of it, and by the beauty of the uncompromisingly functional, brushed aluminum chassis as it reflects the glow from myriad filaments. Interestingly, the X is one of the coolest running tube amps I have ever worked with. Despite running in Class A mode, the output transformers never became more than slightly warm to the touch. The power transformer was warm, but never hot. That the X operates at such cool temperatures compared to some other tube equipment is a pleasant and welcome surprise. The Fi X responds well to tube rolling. Numerous rectifier tubes are available that meet the requirements of the X. These include the 5Y3G, 5Y3GB, 5Y3GT, and 6106, among others. Suitable signal tubes include the 6SF5 and 6SF5GT. 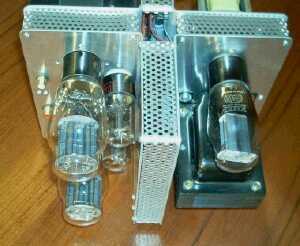 Any NOS or new manufacture 2A3 and type 45 triodes can be used in this amp. The Fi X lacks some of the holographic sharpness of some other amps. When comparing the Fi X to a Decware Zen Triode or BV Audio PA300, some fine detail seems a bit veiled. With some recordings, this prevented the X from achieving the level of delightful holographic imaging that is possible. Of course, as noted above, this characteristic allows the Fi X to pleasantly play some recordings that sound dreadful with super-detailed amps. It also provides the X with the ability to work satisfactorily with less than perfect sources, something the exceptionally detailed BV Audio amp was less able to do. In the end, however, holographic imaging is only a fun sound effect that really has no effect on the musical presentation. Front of X with RCA 2A3 output tubes, Mazda 5Y3GB rectifier. Input jacks and stock 6SF5GT input tubes visible on left. From the first time the Fi X was connected to speakers with 94dB or greater efficiency, a hum was noticeable. This hum did not intrude into the music, but it was quite apparent after working with quieter amps. Once music started the hum was no longer noticed, but its presence could be very annoying to some people. After some experimentation, it was found that changing output tubes could reduce the hum substantially, though it never went away completely. According to Don Garber, the Hammond power transformers tend to be a bit noisy. However, in order to keep the X at the low price point Don was trying to achieve, custom-made power transformers were out of the question. This hum did not intrude on the musical presentation and was only barely noticeable from the listening position with very efficient speakers. The Fi X does not work well with low impedance loads, even when using the 4 ohm output transformer tap. While the Fi worked very well with 8 ohm loads, even with lower efficiency speakers, it worked poorly with a pair of 4 ohm Reynaud Twins. Using a pair Zero Autoformers to double the impedance to 8 ohms resulted in a welcome sound quality improvement, although the relatively low efficiency of the speakers (and the 3-way crossover) would not allow high volume levels. At 3 watts-per-channel, the Fi X is simply unable to work well with most commercially available speakers. Efficiency is important, but so is speaker design. A single-driver speaker that lacks a power-dissapating crossover network works very well with the Fi X. While the 92dB Hornshoppe Horns were only 2dB more efficient than the Reynauds, they could be driven to very high levels with the Fi, as could all the Omega TS line of loudspeakers that were on hand. As with other tube amps I have recently reviewed, there is no protective cage available for this amplifier. This can be a problem for people with young children or nosy pets, although, as previously noted, the X does not run as hot as most tube amps. The Fi X uses a simple circuit design with high quality components in a unique and inspired chassis design. It is a visual delight, especially with the tubes softly glowing and reflecting off the satin finished aluminum of the chassis. The sound quality of the X falls a little short of perfection: bass control is good, but not great; holographic imaging often is indistinct; and it has a low-level but persistent, power transformer hum. Despite its minor shortcomings - and they are minor, it is a joy to hear. The X simply translates audio signals into music. With poor recordings, or marginally matched speakers, the X delivers surprisingly musical and enjoyable output. With excellent recordings and properly matched loudspeakers, the X is irresistible, delivering a musical experience that is often difficult to achieve with Hi-Fi equipment. While analysis of high-fidelity performance is necessary in a review, the Fi X isn't about specifications or pedantic descriptions. Unlike the ultimate 'high-fidelity' rigs, where the greatest emphasis is placed on detail, transients, the strength and depth of bass, and stereo imaging, the Fi X is best described as a whole. It should be related to music and to its ability to convey the emotional content, the ebb and flow of melody and rhythm, and the performances of the musicians. Many designers of 'high-fidelity' products seem to have forgotten the music. There is so much emphasis on fine detail and "near-perfect" measurements that some equipment will make exceptional recordings sound fabulous, and render all others intolerable. Considering the marginal quality of most recordings, this can be a detriment to overall musical enjoyment. The perceived aural qualities of an amplifier will define the purpose for which it will be used. With several amplifiers available from which I can choose, I am able to select one for visceral impact and power, or select another for minute detail and incredible, three-dimensional imaging. I can be quite happy with either, yet I often find myself trying to find ones that deliver a little more impact, a little deeper sound stage, or looking for a recording that really shows off their respective capabilities. In the end, I find that I am most satisfied when I plug a pair of type 45 tubes into the Fi X, sit back in a darkened room, and drift into the music. In my opinion, no greater compliment can be paid to music reproduction equipment. This one is a keeper. Many thanks to Don Garber, owner and audio engineer of Fi Audio, for providing background information and the sample used in this review. Photographs used in this review by Richard George.